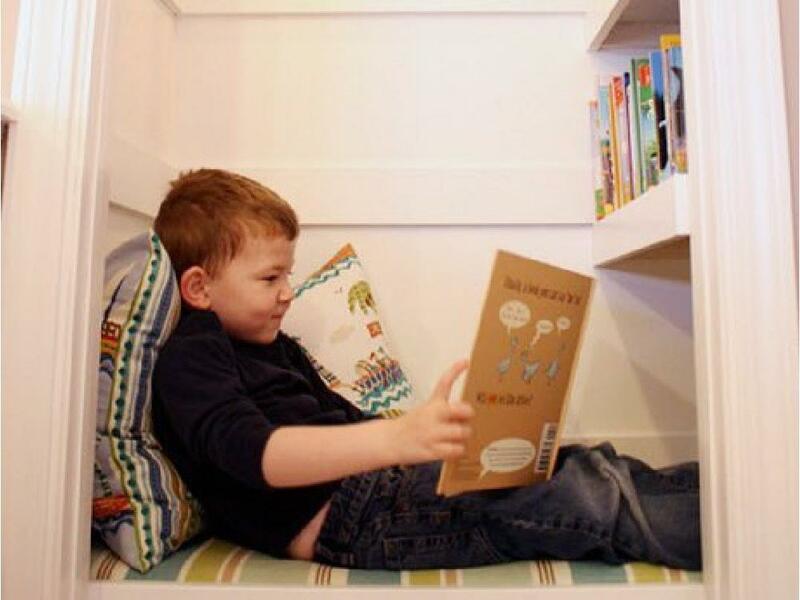 A reading nook carved out of a closet is a great retreat for your child. Your child’s bedroom is their sanctuary and its design, particularly in a condo, is important for several reasons. There are a few differences between condo bedrooms and those in a house that you need to consider — sound, light and one-level living are all typical issues that come into play. Condos tend to be sized down, so you will want to think of your child’s bedroom as a private space where they can escape the noise and activity of the rest of your home. Sound may travel through your condo more readily than it does in a single home, as neighbours are closer and the layout may be more open concept. Secondly, condos will likely offer more light through larger windows, so you will want to invest in effective window coverings. And condos are usually on one level, so as a parent you may be walking by your child’s room more often. This means you will want it to be well designed as much for your own sake as for your child’s. And because your child will have less privacy, think of designing the room as much as possible as a retreat. Here are a few tips on designing the ultimate condo bedroom. Depending on the age of your child, you may want to consider whether the bedroom door locks or doesn’t. For a baby or toddler, it’s better to forego the lock. After all, you wouldn’t want your child to lock himself in during a wilful moment. Plenty of parents learn this the hard way. There are also other things to consider in a baby’s room. One of the most important is how to filter out the light. This is especially important if your condo faces south or west, as your baby will take naps during the bright afternoon. Homes tend to have smaller windows than condos, thereby reducing the available afternoon light. To ensure your baby sleeps well during naptime, install blackout blinds or drapes over floor-to-ceiling windows. You might also consider blackout panels such as those by Restoration Hardware. Now that your wee baby is mobile, you’ll have to partially rethink the space. One thing you might want to add to the room is a tiny, cosy nook or play space. One way to do this is to hang a small bed canopy over some cute cushions. It won’t take up much room but will be an adorable reading nook or play space for your child. Alternatively, you can convert a closet, sans doors, into a reading nook with a curtained entry. This is a great, creative way of saving space. Other items that you’ll want in a toddler’s room are a good lamp for soft lighting during story time, a comfy chair for mom or dad and organizational boxes. Your toddler’s room should not just be a place for the child to sleep, but rather a multi-functional space with a reading corner or cute, esthetic elements that will appeal to a young child. Other fun ideas are painting one wall with chalkboard paint or creating a whiteboard wall that’s also magnetic. It’s especially important for a preteen or teenager to have a private space that is removed from that of the rest of the family. One of the cutest rooms I’ve seen recently featured a loft space accessed via a ladder. While this would be hazardous for a younger child, a preteen or teenager would love it. Including a space like this is a great way of thinking vertically in a condo with high ceilings. A loft area can function as a place for sleepovers, a reading nook or a study space. It’s also important to create desk space in a teen’s room. Large desks are sometimes overrated; perhaps a low shelf may be all that’s needed as desktop computers become less popular. And for teens, you might also consider including an ensuite bathroom in your design plan. Marilyn Wilson has been selling real estate for more than 25 years and owns Marilyn Wilson Dream Properties Inc. Brokerage, an Exclusive Affiliate of Christie’s International Real Estate. She can be reached through dreamproperties.com.